Sara Haddad is an alumna of the program. In 2011 - 2012, Ms. Haddad did not take part of any clubs. Ms. Haddad took part of the Lebanese American University's LAUMUN VIIth High-School Conference and earned a Diplomacy Award. The conference took place in Byblos, Lebanon, on March 31st and April 1st, 2012. 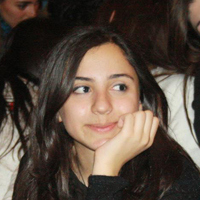 In 2012 - 2013, her Terminale school year, Ms. Haddad served as part of the CMUNTA.